Any production of A Midsummer Night’s Dream, whether play or opera, climaxes in the (hopefully) hilarious performance of Pyramus and Thisbe, a play-within-a-play or opera-within-an-opera prepared by the six Mechanicals and offered as entertainment for the triple wedding of Theseus with Hippolita, Hermia with Lysander, Demetrius with Helena. 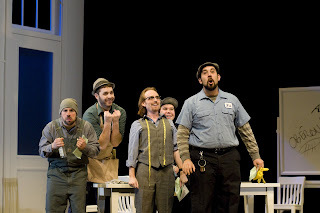 The Mechanicals (so called because they’re “Hard-handed men that work in Athens here, / Which never labor’d in their minds till now”) are a spectacularly unimaginative troupe of would-be artists, and their production is always (in a play) a parody of bad Shakespeare, or (in an opera) a parody of bad opera. Of all the characters in Midsummer, I love the Mechanicals most of all; but that’s probably because I work in a theater, and recognize in them myself and my colleagues. Most of their dumb ideas are things I’ve proudly suggested to people, at auditions, rehearsals, and late-night production meetings! Britten sets the six mechanicals as two tenors (Flute/Thisbe, Snout/Wall), two baritones (Starveling/Moon, Bottom/Pyramus) and two basses (Snug/Lion, Quince/Writer-Director) so he can build a variety of fun ensembles playing with all those different layers of sound. He has the two basses sing absurdly low, at points, and many times asks Flute to sing up high in falsetto, especially when he’s in drag as Thisbe. Since Shakespeare wrote the Mechanicals’ lines in clumsy prose (except for the dreadful poetry of their play), Britten was never tempted to give them catchy tunes. Instead, their music is built from a couple of core motifs, which become running gags as we hear them again and again throughout the show. Above, the opera-within-an-opera in the famous Robert Carsen production. 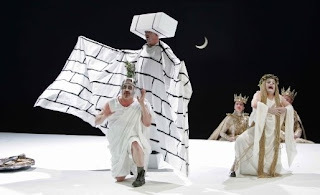 Although Benjamin Britten was an extremely complicated man who created some of the twentieth century’s darkest opera tragedies, it’s good to hear him laughing at himself and the world in Midsummer, his greatest opera comedy. I’ll never forget the ordinarily sober audience at the Metropolitan Opera House laughing ourselves silly at Midsummer’s opera-within-an-opera. We certainly hope our YAP production, which opens tomorrow, will satisfy on this count. Our Mechanicals include Young Artist Alex Mansoori (whose antics as Mime brought down the house in our previous production, Siegfried and the Ring of Fire) as Flute, YAP Alum Marcus Shelton as Snout, Marc-Antoine d’Aragon as Starveling, Jeffrey Madison as Bottom, YAP Thomas Forde as Snug/Lion (who’s moved on from growling as a bear, in Siegfried and the Ring of Fire, to roaring as a Lion in Midsummer!) and Jonathan Silvia as Quince. One last thought for those studying up before attending A Midsummer Night’s Dream: you can find the libretto of the opera, as adapted by Britten and Pears from Shakespeare’s play, here at LIBRETTO.